Be our valentines? Thank you to our Brandefy Review Club members for sending in these informative reviews. Using our side-by-side ingredient comparisons, combined with the reviewers comments, we have rounded up some new favorite dupes. Brandefy compares off brands (e.g., up&up) to name brands (e.g., Listerine) to show you when the generic is as good as the name brand, and to warn you when it is not. Our aim is to help you save time and money, and to have a good time while doing it. Our first review is in a territory we are just getting into- household cleaning supplies. For Target's up&up version of Windex, the reviewer said she did not see any real difference, and both cleaned her glass the same. We gave this an 85% similarity rating, because there was a different ingredient in an already small ingredient panel. That being said, we recommend you switch to save to this glass cleaner. We love that we are moving into cleaning supplies. We were excited when the next review came in! Good quality toilet paper is a necessity, and it can often come at a high price tag. This reviewer compared up&up Premium Ultra Strong to Charmin Ultra Strong. Her entire family felt up&up was stronger and softer. We gave this an 80% similarity score because they did note that they went through the up&up rolls faster, so you must factor that in when considering savings. However, we think a lower cost for a stronger tissue makes for a great switch! Once you've visited the porcelain throne, it is time to wash your hands. We gave the up&up version of Softsoap an impressive 99% similarity rating. In a side-by-side ingredient comparison, we found the ingredients to be the same. Our tester said she could find no differences in the two. This is a great buy, especially during flu season. Our final great dupe, is one you may want to use before your big Valentine's date. Of course, we are talking about using mouthwash to get minty-fresh breath. 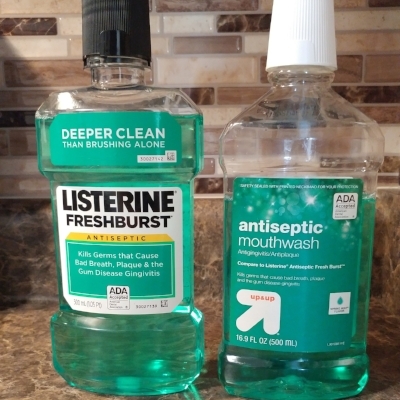 These two (Listerine and up&up) had very similar ingredient panels, and the tester said she would definitely switch to the up&up antiseptic mouthwash. Keep it minty-fresh this Valentine's Day!